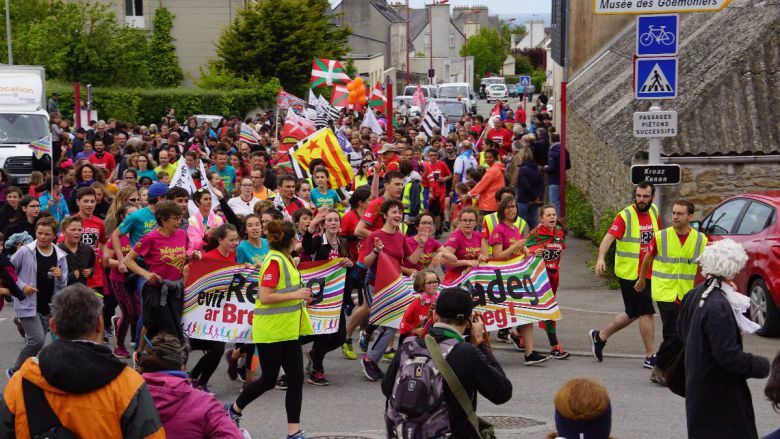 Eurokorrika, the new European project for sponsored races for lesser-used languages, launched at Ar Redadeg – the run for Breton. 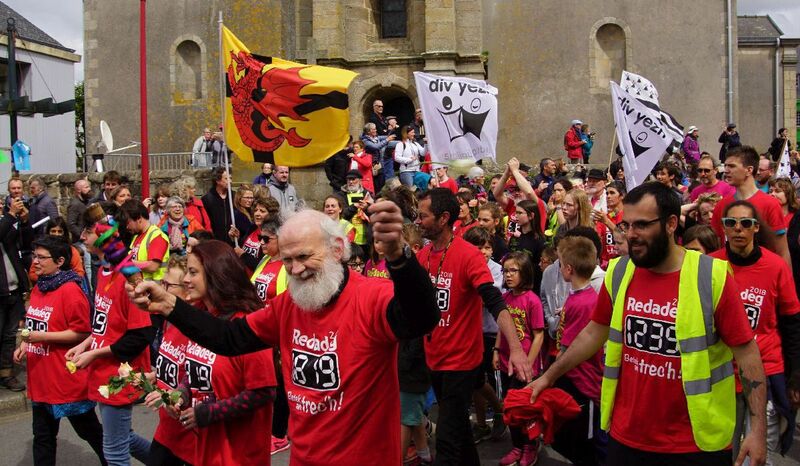 The sponsored race for Breton, Ar Redadeg, starting in Kemper on May 4th and finishing on Saturday May 12th in Plougerne, has raised 180,000 euros for Breton language projects. The event also featured a conference on the different sponsored runs for lesser-used languages with delegates launching the new Eurokorrika project that will see the different sponsored run NGOs work together. 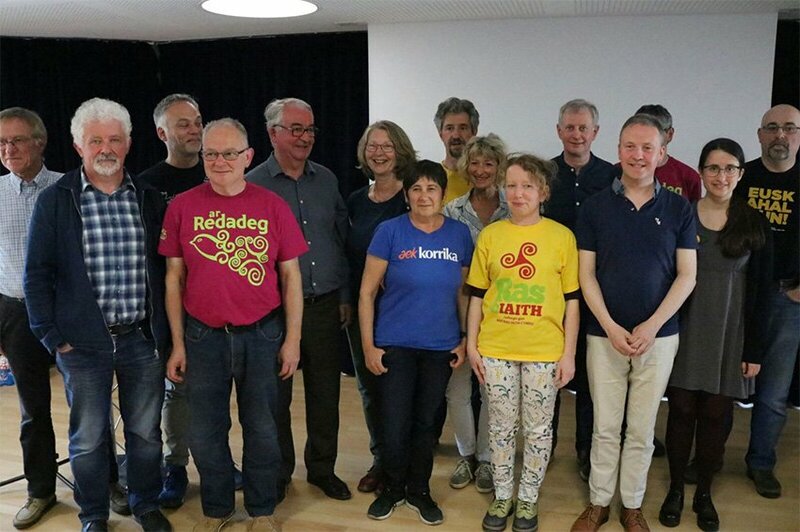 Speakers included Siôn Jobbins and Heledd ap Gwynfor (Ras Yr Iaith, Wales), Asier Amondo (Korrika, Basque Country), Andrea Rodoreda (Correllengua, Catalonia), Marcas Mac Ruairí (An Rith, Ireland), Jean Michel Sanner (Ar Redadeg, Brittany), Patrick Puppinck (Alsace), Mark Trevethan (Cornwall), Daniel Barneix (Bearn), along with Gweltaz ar Fur (Ti ar Vro Kemper), Isabelle le Bal (Kemper Deputy Mayor), Lena Louarn (Breton Region Vice-President), ELEN Secretary-General Davyth Hicks and Vice-President Tangi Louarn (Kevre Breizh), Bernez Roux (Cultural Council of Brittany), and Muriel Lemorvan (TV3 Bretagne). Discussions focused on the challenges and successes that the various sponsored runs have had. Several themes stood out, in particular that the races have not only raised money for vital language projects but that they have an enormous symbolic value in reaffirming support for the language and acting to bring often dispersed language communities together to celebrate their languages. Siôn Jobbins from Ras Yr Iaith described how the race was a declaration of ownership of the land or territory. It meant that for those 10 minutes that the race passed along a street it was a Welsh language street. The races act to inspire confidence in speakers. The conference discussed how races could be run through villages or towns as a show of support for local NGOs and politicians campaigning to open a new language immersion school or community centre. Mark Trevethan, Patrick Puppinck and Daniel Barneix, also made presentations on the possibility of having sponsored runs for Cornish, Alsacian, and Occitan, respectively. Delegates decided to launch a joint project that will bring the different sponsored race NGOs to work together. 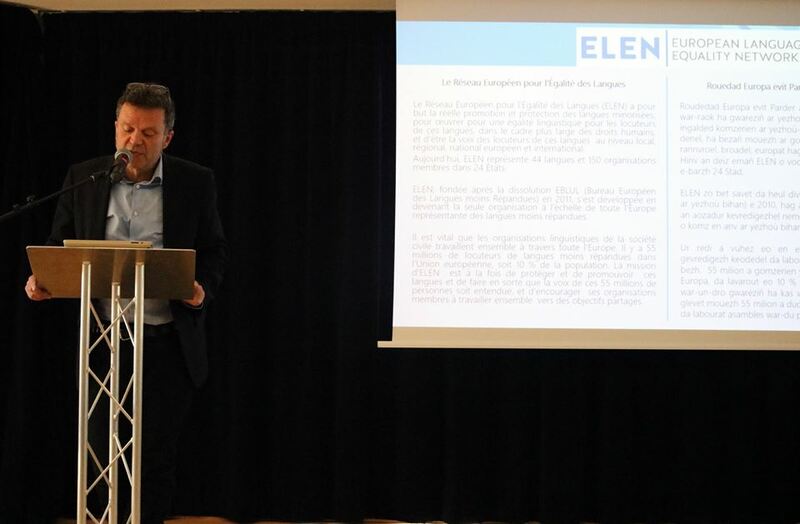 ELEN Vice-President Tangi Louarn presented the new Charter for the project, which will be called Eurokorrika after the Basque Korrika – the first of the language sponsored runs. Bali Breizh, TV3 Breizh, full programme on Ar Redadeg launch event in Kemper. Isabelle le Bal is the first deputy-mayor for KemperQuimper and its community.